Felines are susceptible to arthritis just as canines. Though in dogs this problem is quite evident, cats don’t manifest signs of joint issues easily because of their overtly active nature. Unless the pain isn’t severe or they find serious difficulty in climbing, cats don’t stop. This makes it hard for the pet owners to notice signs of arthritis in their kitties. However, cats do suffer from severe joint pains and in fact, are more susceptible to arthritis than dogs. A cat suffering from joint aches may exhibit subtle signs of arthritis which commonly include – reluctance to climbing and jumping, favoring one leg, become reclusive and do not groom them. Pain makes them more irritable and highly aggressive at times. So, if you have a feline at home that needs your attention, here are some tips you can follow to take good care of your arthritic kitty. Obesity is the most common cause of joint troubles in cats. Those extra pounds put unnecessary pressure on the cat’s knees which leads to excessive wear and tear of her joints. Thus, maintaining an optimum weight is extremely important for pets to stay free of joint troubles. So, measure your kitty’s weight and make her shed that extra fat in her body by providing the right amount of healthy food. Cat’s diet usually has fish, chicken and other meats. However, with the advent of packaged foods for animals that claim to provide complete nutrition, pet owners usually feed their felines with these easy to provide, fuss-free munchies. Though it is fine to feed such foods sometimes, a cat’s regular diet must be comprised of whole meats and must be mostly wet in consistency. A well-balanced diet is thus always recommended to keep joint problems at bay. Joint supplements are highly beneficial in preventing arthritis in cats. Glucosamine, Chondroitin, and MSM in these supplements are known to repair the withered cartilage and adjoining connective tissues of the joints by facilitating cell growth and stopping the degeneration process. Some supplements also come with corticosteroids which act as pain relievers. So, whenever you shop for joint supplements for your beloved cat, do watch out for these ingredients. Massage isn’t just for humans. It is quite beneficial for our pets too. Nice warm compresses or oil massages are very helpful in relieving joint pains in cats and dogs. Massage increases the blood circulation in joints thus providing oxygen to the cells hence facilitating mobility of joints. 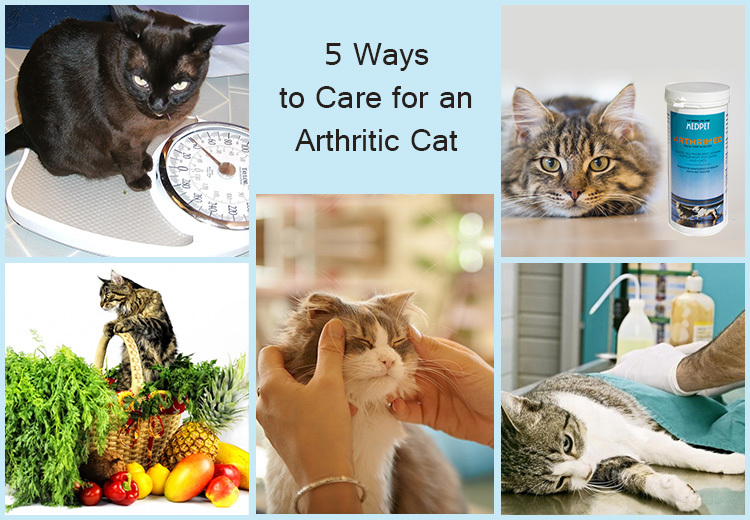 Acupuncture is also a great way to combat arthritis in cats. It is painless and can help the cat to deal with arthritis in a better way. Joint replacement surgery is a great option in cats that have completely lost their mobility due to severe arthritis. It is a long-term solution to keep the cat pain free and gives new life to the lethargic immobile kitty. Consider this option if her stress is unbearable. Overfeeding is a common issue in all the US households that own pets. This practice is increasing the number of cases of arthritic issues in cats thus must be taken into serious consideration. As per the vets’ recommendations, maintain a healthy optimum diet for your cat and put her on a joint supplement from a very young age to avoid joint issues with growing age. Your attention and awareness can save your furry munchkin from a lot of distress in future, so better follow these tips and keep your cat active for long. « Can I Treat My Dog with Flea and Tick Topical Treatment if He is Wounded?